There is a rich air of Renaissance romance in the specially dyed deep burgundy and /copper overdyed silk ribbon, garnet and lavender silk flosses, shimmering beads, and White work lace. Truly a lovely gift for all loving occasions! A delight of textures and techniques for everyone, the Sampler or Box Top are ideal for the intermediate specialty stitcher! You will work Bargello, Rhodes Hearts, Triple Rice Stitches, Herringbone, Double Running, Plait Stitches, and Four Sided Stitches. (Cut 9" X 18" for framing). The richly coloured floral heart in the middle of this lacy whitework square, decorates the top of this Sudberry memory box. It is an ideal gift for someone you love. It will look at home in a bedroom, holding love letters, or on your living room side table, containgin photos of recent family events to show to visitors. Reminiscent of old keepsake boxes, this unlined wood box is the perfect receptacle to hold your treasures, whether they be your stitching accessories, or souvenirs…. 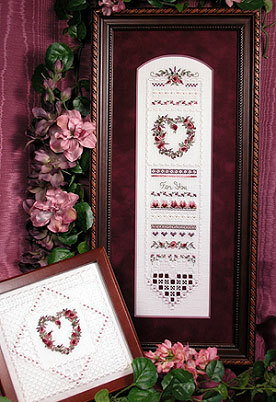 Use the separate chart inside this leaflet to stitch the original Renaissance Lace Box top design. It would make a perfect gift for MOTHERS' DAY! 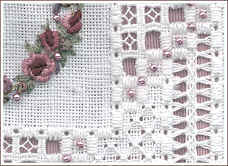 This design is shown mounted in a Sudberry's plain wood box (shown on the back cover), which has a 5" x 5" inset area, and is available at your local needlework shop (or you can order it online at www.sudberry.com). We will continue to offer the Renaissance Lace Box top Cyberclass online.. as we still have a very limited stock of Cyberclass Kits (pattern, all materials, and student notes) left in stock. 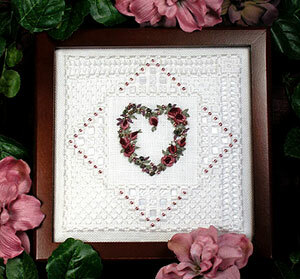 Take this Cyberclass if you want to learn how the whitework and bullion knots are done!